Deindustrialization refers to the process of social and economic change ignited by the removal or reduction of industrial activity. Deindustrialization is primarily caused by offshoring and shifts toward service sector economies. Deindustrialization can have serious socioeconomic consequences in urban areas that used to be reliant on the manufacturing industry for jobs. The shift to a service sector economy is called economic restructuring. Real industrial production rose in the United States in every year from 1983 to 2007. However, the number of American workers in the manufacturing industry has declined steadily from its peak of 31.5 million in 2000.
economic restructuring: Economic restructuring refers to the phenomenon of shifting between two types of economies, such as from a manufacturing to service economy or agricultural to manufacturing economy. balance of trade deficit: A situation in which a country imports more manufactured products than it exports. Foreign direct investment: Foreign direct investment is investment directly into production in a country by a company located in another country, either by buying a company in the target country or by expanding operations of an existing business in that country. Deindustrialization refers to the process of social and economic change ignited by the removal or reduction of industrial activity/capacity in an area that was formerly supported by the manufacturing industry. Deindustrialization is limited to recent historical moments. It is the inverse process of industrialization —the process of social and economic change that began in the eighteenth century, transforming agrarian societies into industrial ones. Deindustrialization is marked by some combination of four elements. First, a straightforward decline in the output of manufactured goods or in employment in the manufacturing sector may indicate deindustrialization. However, not every simple decline in output or employment of the manufacturing sector necessarily indicates deindustrialization; short-run downturns may be part of the economic cycle and should not be mistaken for long-term deindustrialization. Second, deindustrialization may be indicated by a shift from manufacturing to the service sector— economic sectors that focus on serving others rather than producing some physical object. Service sector jobs are seen in government, telecommunication, healthcare, banking, education, legal services, tourism, real estate, or consulting. This shift towards service sector employment would result a shrinking manufacturing sector. Third, deindustrialization can be marked by a balance of trade deficit, or a situation in which a country imports more manufactured products than it exports. Finally, deindustrialization can be observed when a nation’s balance of trade deficit is so sustained that the country is unable to pay for the necessary imports of materials needed to further produce goods, initiating a downward spiral of economic decline. How is it that economies find themselves in situations of deindustrialization? One explanation centers on economic progress. As economies that were once industrial improve their methods through technological innovation, businesses will find ways to increase productivity or product growth while decreasing the amount of resources they need to devote to production. One “resource” that is particularly expensive is labor. With better technology, employers are able to produce at least the same amount of their product with fewer employees. The decline in employment in manufacturing sectors that comes about from this progress can indicate deindustrialization. Another explanation focuses on economic restructuring—institutional and governmental encouragement of the development of a more robust service sector, often at the expense of the manufacturing sector. As the service sector has developed, more and more manufacturing plants have shifted their operations overseas in a process called offshoring. American companies are still involved in the financial aspects of the company; the company remains an American property or American financiers invest through foreign direct investment in companies based abroad. In this model, daily operation occurs overseas, including the hiring of foreign workers in the country where the manufacturing operations are now based. Offshoring demonstrates the importance of scale when considering the process of deindustrialization. While moving a company from the United States to India might result in deindustrialization in America, it does nothing to diminish industry globally. Rather, it redistributes industrialization to India. As such, deindustrialization can be seen as a redistribution of industrial capacity and development rather than a simple decline. When one limits one’s view to a national context, deindustrialization is seen as a crisis. The fact that global industrial capacity has merely been redistributed is little comfort when jobs are being lost at home. According to the Organization for Economic Cooperation and Development (OECD), real industrial production rose in the United States in every year from 1983 to 2007. However, people commonly refer to the United States being in caught in a deindustrialization crisis; growth has slowed and more countries have moved their operations overseas. The number of American workers in the manufacturing industry has declined steadily from its peak of 31.5 million in 2000. The city of Detroit represents the deindustrialization crisis in the American context. After free-trade agreements were instituted with less-developed nations in the 1980s and 1990s, Detroit-based auto manufacturers relocated their production facilities to other countries with lower wages and work standards. This process took a heavy toll on an auto industry, which was already losing jobs due to technological innovations that required less manual labor. Detroit was once a center of production associated with a high-quality, middle-class standard of living. Today, Detroit is associated with a high concentration of poverty, unemployment, noticeable racial isolation, and a deserted urban center. Deindustrialization can have strongly negative effects in urban areas that were formerly heavily reliant upon the manufacturing sector. 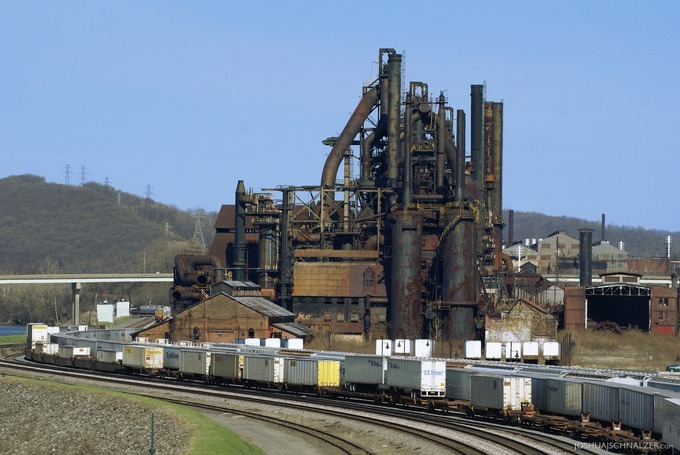 The United States Rust Belt: The Rust Belt refers to northern U.S. cities that have undergone rapid deindustrialization, including the loss of manufacturing jobs. On the map, green areas have seen gains in manufacturing jobs while all other areas have experienced losses. Deindustrialization and Redevelopment: This former Bethlehem Steel Plant in Pennsylvania was demolished after the company went out of business. It has been replaced by a casino.